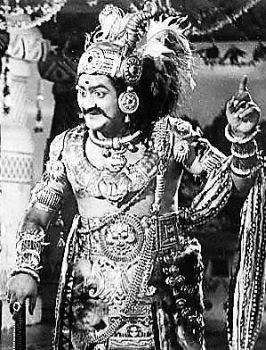 Mayabazar is a Telugu film first released in the Andhra Pradesh, India on March 27, 1957, produced by B.Nagi Reddy and Chakrapani. The film was directed by the great telugu director K. V. Reddy. Mayabazar is renowned as one of the best films ever made in the Telugu film industry. The music delivered by Saluri Rajeswara Rao and Ghantasala has been extremely popular. 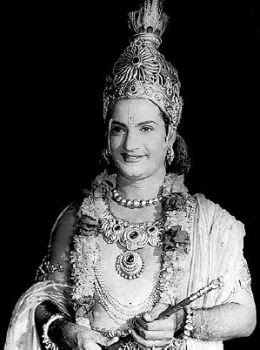 The film stars NTR as Krishna, ANR as Abhimanyu, S. V. Ranga Rao as Ghatothgacha, and Savithri as Sasirekha. The film however is based on a popular Hindu mythological tale called "Sasirekha Parinayam", derivative from Mahabharata. During the exile period;Arjuna; one of the 5 Pandavas sends one of his wives, Subhadra and son Abhimanyu to Dwaraka;where her 2 elderbrothers;the Lord Shri Krishna(N.T.R.) and Balarama reign. Sasirekha(Savithri) is Balarama's daughter and is in love with Abhimanyu(A.N.R.) since childhood;and their parents also promised that Sasirekha will be Abhimanyu's wife, when she comes of age. After 10 years, when Sasirekha comes of age however, Balarama and his wife think otherwise. Balarama's wife is a greedy woman and wants her daughter married to Duryodhana's (Kaurava leader) son Laxmankumar (Relangi), as Abhimanyu's father - Arjuna has lost his kingdom; while Balarama has soft corner towards Duryodhana (as he is Balarama's disciple). But Sasireka, Lord Krishna and Subhadra oppose this change of plan. Now Krishna asks Subhadra to approach Ghatotkacha (Son of Bhima, a Pandava); who possesses magical powers of Asuras (His mother is an Asura); who will readily come to their help. Now Ghatotkacha (S.V.Ranga Rao) goes to the place where the marriage is scheduled and disguises himself as Sasirekha (through magical powers) and send away the real Sasireka to the place where Abhimanyu and company are camping. When Laxmankumar approaches Ghatotkacha thinking her to be Sasireka he gets the shock of his life, as it is a demon and not the beauty! Towards the end, Ghatotkacha displays his magic(Maya) to Duryodhana and his evil-minded kinsmen and drives them back to Hastinapura (Duryodhana's capital). 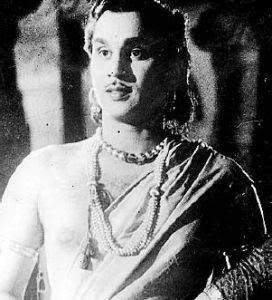 Maya Bazaar's songs are legendary in Telugu cinema. The titles of almost all the songs have been reused as movie names in later years. * Ahana Pellianta - Actress Savtri's stunning dual portrayal of a princess and a monster-prince cemented her acting prowess in Telugu Cinema. * Lahiri Lahiri - A great portrayal of romance spanning three generations. * Sundari Oho Sundari - Relangi's humorous song that makes many people still laugh when they see some one clap hands behind their back.